The Public Accounts Committee has also heard details of how over €21 million in allowances is distributed among over 300 Irish officials serving abroad. DFA Secretary General David Cooney at the PAC. IRISH AMBASSADORS ARE and their families “often acting as janitors” in some embassy buildings, the Public Accounts Committee has heard, as it was revealed that 21 of 73 Irish embassies have full-time cooks. Department of Foreign Affairs secretary general David Cooney has defended some €21.25 million in allowances paid to Irish officials serving in dozens of countries across the world. This works out on average at €66,000 per official. Ambassadors, who are paid €140,000 annually, and diplomats are entitled to several different allowances including a local post allowance, a cost of living allowance and, in some cases, a rent allowance for accommodation, TDs on the Oireachtas committee heard yesterday. The committee heard that all of these allowances have been reduced in recent years and that rent allowance and the payment of school fees for diplomats’ children must be applied for. Labour TD Derek Nolan said that the €21.25 million spent in 2012 meant that on average around €66,000 was spent on 325 Irish officials serving abroad, on top of salaries. Nolan said this was 28 per cent of the overall budget and queried whether officials serving abroad stood to benefit from getting a rental allowance if they also had a home in Ireland. He claimed during the course of the hearing that he was being “scoffed at” but Cooney said he regretted if the TD felt that was the case. He insisted that it would be “untenable” to pursue each diplomat regarding their private circumstances. “We’re often acting as janitors for embassies,” he said, saying that the upkeep of facilities can be taxing and there is “a lot of disruption involved” for diplomats, their spouses and their families. Cooney insisted that he was happy to stand over system that compensates officials serving abroad so as that their income is not lower than if they had stayed in Dublin. He said that in the case of the 21 full-time cooks the total cost is €430,000, working out at around €20,000 per cook. He insisted that ambassadors pay for all the food they eat themselves and said the cooks are employed for the purposes of networking and entertaining. “In my experience, it’s cheaper you get better value from having a live-in cook… you get more out of a full-time cook than you would if you had to hire people on an occasional basis,” Cooney explained. He added that such supports are there for people “to do their job” saying there was a “a lot of disruption” involved in the life of an ambassador and that “it’s no picnic”. “I’d rather be at home on a Saturday, with a beer, watching Match of the Day, than going out for some reception,” he said. 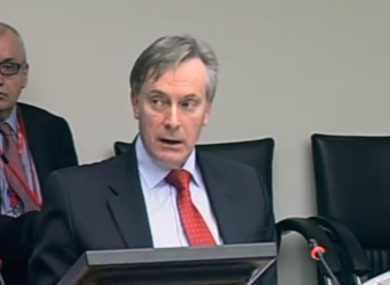 Later, PAC chairman John McGuinness told Cooney, who is leaving his post shortly, that he had “sold himself short” as embassy staff do “substantially more” than the senior official had explained to Nolan. “You have to be there to experience it,” McGuinness said. Email “Irish embassies employ 21 full-time cooks, but our ambassadors are 'often acting like janitors'”. Feedback on “Irish embassies employ 21 full-time cooks, but our ambassadors are 'often acting like janitors'”.